Selling beauty products is the perfect way to make some money with a product that you use every day and love. There are a ton of companies that offer individuals, such as yourself, the opportunity to sell beauty products right from your home or even online. Not only will this business venture allow you to make a little extra cash on the side but it can become a very lucrative career if you are successful at it. 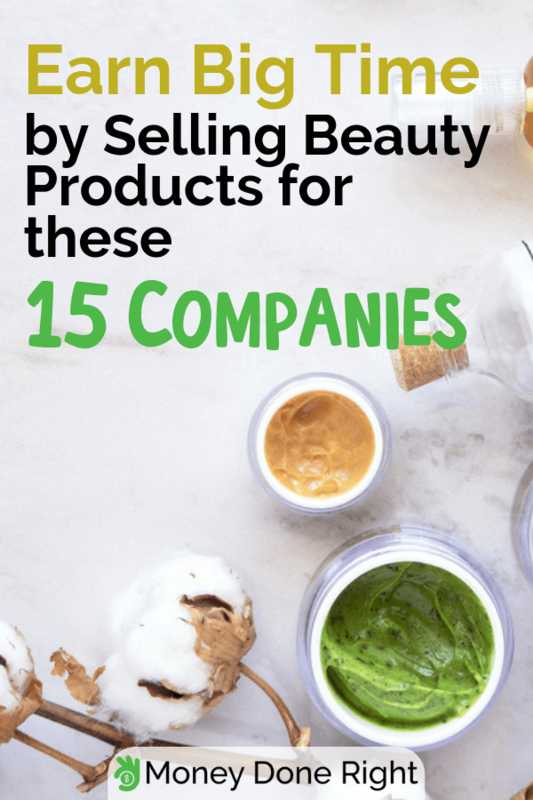 These 15 beauty companies are eagerly waiting for participation from people just like you to start their own business selling the makeup and accessory beauty products that they have to offer. Read on to see which beauty company is right for you and can help you make some serious cash with a product that you already have a passion for. Are you looking to make money with your own home business? Find out how you can make a living with right from your own home. Avon has been around for 130 years, selling an array of beauty products including skincare, color cosmetics, fragrances, and personal care products. Its sales representatives can invest in starting their own business selling Avon products at the low cost of only $25. This will give you access to an online storefront as well as brochures and everything you need to get up and running. As a sales representative with Avon, you will receive 40 percent on the first sale you make, giving you a quick way to earn some fast cash. Secondary and later sales will be paid at a separate rate based on revenue and effort. Avon is well-known throughout the beauty industry, and you’d be hard-pressed not to find a woman that hasn’t used or is using one of its products. Arbonne is another beauty product company that can allow you to start your own business as an independent consultant. Arbonne sells products that are good for the environment as well as for use by you. This is a good business opportunity if you are looking for beauty products that are natural and environmentally friendly. As an independent consultant with Arbonne, you will need to pay a $49 registration fee, but you will earn 35 percent on your personal sales and a 15 percent commission on your preferred client purchases. One of the nice things about Arbonne is the products are sent directly to the customers, which eliminates the need for personal delivery by you. The company also offers bonus incentives for top sales including cash, trips, and jewelry. Arbonne also provides its independent consultants all the social media tools they need to promote the beauty products they are selling as well as support and assistance from an online community. You’ve probably heard of Mary Kay and wondered if it is a smart option for selling beauty products. With a well-recognized name and a history that dates back over 40 years, you can’t go wrong with this opportunity to sell beauty products out of your home. Mary Kay has beauty consultants all over the world, and to join the company, you need to hook up with a current representative. Not sure how you can do this? Mary Kay has made it easy to search for beauty consultants on its website. You will need $100 for your starter kit which promises to provide you everything you need to start selling Mary Kay beauty products. Plus, the company offers training and online tools to help get your business off the ground. If you are looking for another way to get your business off the ground, try one of these moneymaking opportunities. With Beachbody, you will see your clients transform their body as you coach them on the right moves to make it happen. With over 350,000 independent consultants, Beachbody offers fitness and training programs and also sells fitness equipment and the popular Shakeology brand of products. To become a coach with Beachbody, you need to pay $39.95 for your digital business starter kit, which includes all the tools you need to get started. After 30 days, you will be billed $15.95 a month to continue as a coach with the company. You may want to buy Beachbody’s Challenge or Performance pack, which includes the necessities for fitness, nutrition, and support that you can begin using with your clients. You’ll earn a 25 percent commission on all your retail sales and $90 for every Beachbody Challenge pack you sell. Plus, if you add additional coaches as part of your network, you’ll earn even more as you lead them with their business. Choosing Scentsy is a fun beauty venture as you are able to sell popular products such as scent warmers and diffusers as well as cleaning, laundry, and beauty products. To start to sell beauty products with Scentsy, you need a sponsor to help sign you up. They will guide you through the process of starting your own Scentsy business. Scentsy offers its consultants the opportunity to sell with home parties as well as with an online storefront. The starter kit with the company costs $99 but gives you a good array of items to get you started. Plus, your business enrollment fee covers three months of website hosting. This fee goes to $10 after the introductory three months. With Scentsy, you’ll earn vacations, bonuses, and more as a consultant. You will also receive an exclusive gift just for joining the company. The beauty products from doTerra vary greatly with a line of essential oils to a series of skincare, haircare, and spa products to sell. As a doTerra wellness advocate, you can purchase products at 25 percent off the retail price while earning free product credits to beef up your beauty stash. There is no monthly fee for your own personal website through the company and you are welcome to sponsor new wellness advocates at any time to increase your business revenue. doTerra offers a range of incentives to its wellness advocates from trips to training to conventions and retreats. To find out more about starting a business with doTerra, you need to connect with a wellness advocate about the opportunity. This can be done through the company website. 31 Gifts is a unique selling opportunity as it offers an array of storage, carryall, and tote products. Joining the company costs $99 for the signature kits of products or $179 for the deluxe kit of products. You will earn a 40 percent discount off products and start at a 25 percent commission on everything you sell. You are welcome to sell 31 Gift products at home or office parties or on your own personal website. The company also offers plenty of incentives including a trip to Disney for its sales consultants. Want more ways to make money from home? Click here! You’ll be able to sell a large array of beauty products when you join Jafra as a consultant. Jafra was started in 1956 and is known for its skin care products. It also has a line of fragrance, makeup, and bath and body products. The cost to start your own business and make money with Jafra is only $39. This will give you access to your own special business kit or you can upgrade to the royal business kit for $99. The company also offers benefits such as jewelry, cash, trips, and plenty of free products for joining as a consultant. By becoming a consultant with Jafra, you’ll earn up to a 50 percent commission on everything you sell as well as through team sales as a leader. L’BRI offers an extensive range of beauty products for your skin, body, aging, sun care, cosmetics, and health and wellness. These products are able to be tried before committing to buying them with an array of free samples. To start as a L’BRI consultant, you will need to pay $299, but you will have access to $1,000 worth of products as part of your starter kit. You’ll also earn discounts on products up to 45 percent and be privy to special incentives offered by the company. There is also no inventory to carry as L’BRI ships products directly to the customers that purchased them through you. L’BRI boasts high customer retention and reorder base, making it possible to earn quickly as a consultant with the company. If you are into makeup, you’ll adore the SenGence from Lipsense. This company sells the long-lasting lipstick as well as anti-aging skincare products and the SenseCosmetics lineup. Signing up to be part of the Lipsense team is easy, and you’ll immediately be able to purchase beauty products at a 20-50 percent discount while receiving quick income from your sales. With Lipsense, you do have to buy the product upfront, so you will need to carry an inventory and shell out some cash for the products you think your customers will want to purchase from you. By signing up new distributors under your leadership, you can increase your sales and earnings with Lipsense. You can also earn a car through the company and plenty of trips too. There are plenty of ways to earn money from home. Find out here how you can start your own business. Through Jamberry Nails, you’ll sell nail wraps that adhere to a person’s nails for a unique and appealing look. As a consultant with Jamberry Nails, you build your own business with a starter kit that costs $29.95. The kits offer a range of products that you can display for your customers at home parties or use as samples. With Jamberry Nails, you’ll earn up to 30 percent commission on every sale that you make with the option to earn bonuses along the way. The company also offers bonuses such as trips and recognition programs to keep you motivated as you sell its beauty products. Rodan & Fields is a skincare company that was started by the same makers of Proactiv Solution. This popular skincare brand has been turning heads as it has clinically proven to produce results with its products. To join the company as a consultant, you need to find a sponsor that will take you through the process of joining. Finding a sponsor is easy. You can just submit a form directly on the company website. You’ll earn through sales commission, new team members, retail profits and bonuses. To start as a Rodan & Fields consultant, you’ll have to pay a $45 enrollment fee. But, you will also receive plenty of bonuses and perks including once-in-a-lifetime trips. While Younique is known for its 3D Fiber Lash Mascara, it has been selling a variety of beauty products since 2012. The company offers consultants the opportunity to start their own business and join the company with the purchase of a $99 new presenter kit. As a beauty consultant with Younique, you’ll earn party rewards, compensation, and the opportunity to own a car through the company. Sales commission is deposited to you within three hours of making a sale, making it possible to earn quickly with this at-home business. You’ll also earn your own Younique debit card after $50 in earnings. You’ll also receive a free personal website and specialized training to ensure your business thrives with the company. You can earn even more money with an at-home or online business. Click here to find out more. With a history that dates back 30 years, NuSkin offers face and body care products as well as an array of makeup items. As a brand affiliate with NuSkin, you’ll earn a commission as well as retail markup revenue when you buy products at wholesale. There is an array of kits for purchase that range in price and a series of incentives from the company to keep brand affiliates motivated. NuSkin said it has provided 11 billion in compensation to its brand affiliates to date. Another way to sell beauty products is through Young Living. This company sells more than essential oils as it also has cleaning and animal care products, vitamins, and weight management products as well as makeup. With Young Living, you’ll save 24 percent off retail pricing and earn on the products that you sell. You’ll also be a part of special sales and opportunities with the company and have significant earning potential. Young Living also operates a rewards points program to help you earn even more as a team member. There is also the opportunity for cruises, recognition programs, and conventions to help build your personal business through the company. As you look to find a way to sell beauty products, consider these 15 makeup, skincare, and beauty accessory companies. They can help you earn money from your home or online by selling a product that you are passionate about. If you are looking to earn even more, try these ways to earn extra money. What do you think about these moneymaking opportunities in the beauty industry? We want to hear from you. Did we miss a key at-home or online beauty business? Let us know.